← Sticky Lemon Chicken – one pan, less mess! My bestie girlfriend (and home cook extraordinaire) VH has been telling me about this recipe for ages, and I’ve never had the balls to try it. Why? Shortcrust pastry. I’d never tried making my own shortcrust pastry. And if anyone knows me well, they know that if I have a dinner party at home, they should show up at least 30 minutes late, because I inevitably always take longer that expected. And so as to not keep my dinner guests waiting for 2 hours, I’ve never tried shortcrust pastry for fear of messing it up and having to serve my guests raisins for dessert. A few weekends ago, I finally bit the bullet and took a shot at it. This one is a really great recipe by Michelin-starred chef and Gordon Ramsey protégée , Angela Hartnett. Although it takes some time, the final result is worth all of the kneading, poaching, rolling and chilling (not you, the pastry). Preparation 50 mins, 1 hour 15 to bake, plus chilling and cooling. Serves 6-8 (depending how greedy they are). 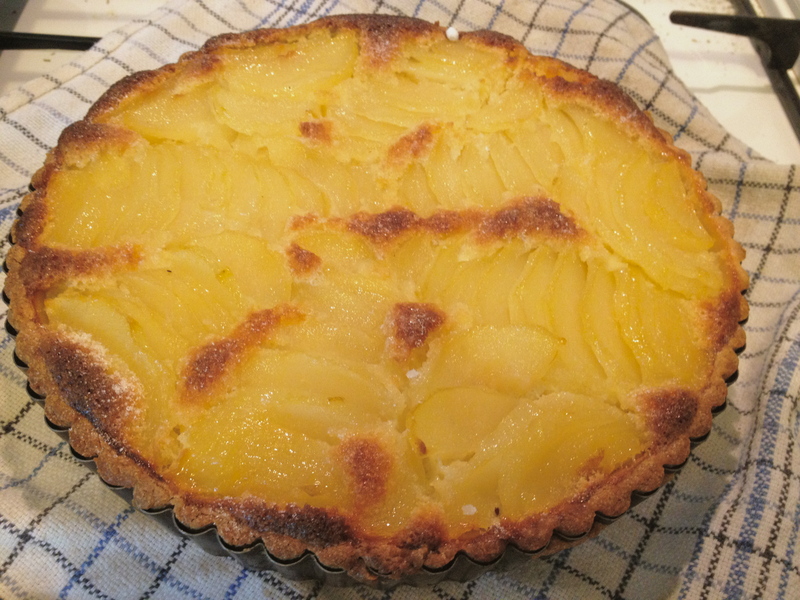 You will need a 23 x 2.5cm round, deep, fluted, loose-bottomed flan tin for this tart. ♥ Make the pastry. Tip the flour onto a work surface. Cut the butter into cubes and dot over the flour. Sprinkle with the caster sugar. Using your fingertips, rub the butter, flour and sugar together until the mixture resembles breadcrumbs. Make a well in the centre, add the egg yolks and, using your fingers, gradually draw in the flour. Knead lightly, until it comes together in a smooth ball – you might need to add 1 teaspoon cold water if the dough is very crumbly. Wrap in cling film and chill for at least 30 minutes. ** Make sure the butter is very cold, or else you won’t achieve that breadcrumb consistency. ♥ Make the frangipane filling. Cream the butter and sugar together in a large bowl until light and fluffy. Gradually beat in the eggs, one at a time, then fold in the ground almonds and flour. Mix well and chill until needed. ♥ Prepare the poached pears. Put the sugar in a saucepan, pour in 500ml water and place over a medium heat. Stir until the sugar has dissolved. Peel the pears and add to the pan, along with the cinnamon and cloves. Squeeze the juice from the lemon into the pan and add the squeezed lemon peel and orange zest. Split the vanilla pod in half, scrape out the seeds and add to the pan with the pod. Add some more water to just cover the pears. ♥ Roll out the shortcrust pastry. Preheat the oven to 190°C/fan170°C/gas 5. On a lightly floured work surface, roll out the pastry to a circle large enough to line the tart tin. Don’t worry if it breaks up, as this is a very short, crumbly pastry – you can just patch it together in the tin and mould it up the sides, making sure it is even all over. Trim off any excess pastry and spread the frangipane evenly on top. ♥ Finishing off with the pears. Cut the pears in half lengthways and, using a teaspoon, scoop out and discard the core from the centre. Cut each pear half in slices, widthways, then push down on the pears slightly to fan them out. Slide your knife under the fan of pears and lift into the pastry case, arrange them in a circle. Fill in the gaps between each pear half with a few more slices and arrange some in the centre. ♥ Bake it! Bake for 55 minutes to 1 hour, until the pastry is golden and the filling is set. Sprinkle with the extra 2 teaspoons caster sugar and bake in the oven for a further 15 minutes to finish off the browning. Cool in the tin slightly, then remove and transfer to a wire rack. Serve warm or at room temperature with a dollop of crème fraîche. It may seem like a long and drawn out affair, but it is so totally worth it in the end, when you slice that baby up and serve it to your guests! You feel like a proud parent (or I imagine as a proud parent would feel), watching the amazing creation that they’ve nurtured and moulded, disappearing from the plate into someones mouth. And although you are proud of your creation, you are sad that someone is taking it away, and that you can’t keep it all to yourself! I did my tart shopping at grEAT, and their fruit section is stupidly expensive. I always feel so silly for buying fruit there, although the truth of the matter is, they do sell amazing imported fruit. This time was no different, as I gingerly picked up four Poires William (also known as Bartlett Pears in the US), and tried to nod and smile while she stuck a sticker for $120 on the bag. These pears poached beautifully and really held their shape well when baked in the tart. If you are looking for a lazy dessert one day, why not try just poaching the pears using the same method, but simply serving them with a scoop of ice cream? For us one day, it was a very welcomed light lunch-time dessert. On my first try, my pastry was a bit too thick – I was scared that if I rolled it any thinner it would crumble to smithereens! Next time it will be thinner – I thought that patching it up in the pan would be a sign of weakness and poor pastry rolling – but if Angela does it, then you/I can do it! I noted that the frangipane was a little too solid for my liking, I would have preferred it to be a bit less dense. I think it might be my oven, as it tends to be hotter than other ovens. I’ll try to lower the temperature slightly next time. JY also suggested maybe adding a splash of cognac to the crème fraîche for that extra layer of flavour – sound good to me! If you’re having leftovers, pop it in the microwave for 20 seconds before eating – it almost tastes better than when it first comes out of the oven!